The National Shooting Sports Foundation (NSSF) today filed a lawsuit challenging the legal authority of the Bureau of Alcohol, Tobacco, Firearms and Explosives (ATF) under the Gun Control Act to compel 8,500 federally licensed firearms retailers in Arizona, California, New Mexico and Texas to report the sale of two or more rifles. The ATF has issued new requirements, effective August 14, which would compel firearm retailers in these four states to report multiple sales of any semi-automatic rifle larger than .22 caliber and capable of accepting a detachable magazine that are purchased following an FBI background check by the same individual within five consecutive business days. 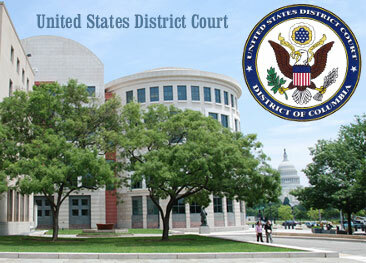 NSSF’s lawsuit, filed in the U.S. District Court for the District of Columbia, seeks an injunction to block ATF from implementing the reporting requirement. ATF has sent “demand letters” to firearms retailers in the four states to inform retailers they must begin reporting such sales by August 14. NSSF Senior Vice President and General Counsel Lawrence G. Keane pointed out that if ATF can require this record-keeping and reporting requirements in these four states simply by sending a letter demanding the information, then there is no record or report ATF cannot require of any licensee, anywhere in the country, for as long as ATF wants. “This is the proverbial ‘slippery slope,’ and our industry is extremely concerned about it,” said Keane. Even if ATF had the legal authority to require multiple sales reporting for long guns, NSSF believes the policy would still be unwise. The NSSF suggest that illegal firearms traffickers will simply alter their schemes to avoid and evade the reporting requirement, making it more difficult for retailers to identify and report suspicious activity. For example, traffickers could simply move their illegal trafficking activities to other states where the reporting requirement does not exist. Also today, the National Rifle Association filed a separate lawsuit in the U.S. District Court for the District of Columbia challenging ATF’s requirement for reporting multiple sales of rifles. Share the post "NSSF Sues to Block ATF Multiple Sales Reporting Requirements"
The Ultimate Benchrest (UBR) National Championship will be held August 6th at Buck Creek, Kentucky. No the Ultimate Benchrest Championship is not like the Ultimate Fighting Championship (UFC)– there are no over-muscled brawlers with tatoos in a cage. Ultimate Benchrest is like any other registered benchrest match for SCORE, except for the targets. To “level the playing field”, UBR uses different-sized targets for different calibers. This way a .30-cal rifle, such as a 30BR, does not enjoy an inherent advantage by virtue of its larger diameter bullet making a bigger hole in the paper. You can shoot 22 caliber, 6mm, or .30 caliber, and have an equal chance of winning. The event starts at 9:00 am on Saturday, August 6th. The range is located at 7204, Highway 1003, Somerset, KY 42501. You can set your GPS for: N37 05.792 + W84 23.961. Though all available spots for competitors are filled, match diectors still invite folks to “come on over” to see what this game is all about. For more info, visit www.UltimateBenchrest.com. Share the post "Ultimate Benchrest National Score Championships on August 6th"
Here’s an opportunity for your wordsmiths out there. Write a 200-word essay and you can win a ton of range gear in Champion’s Third Annual Range Contest. This contest gives shooters a chance to win a fully-outfitted personal shooting range system worth more than $1,700 — all with a 200-word online essay submission. Two additional prize packages are also up for grabs. 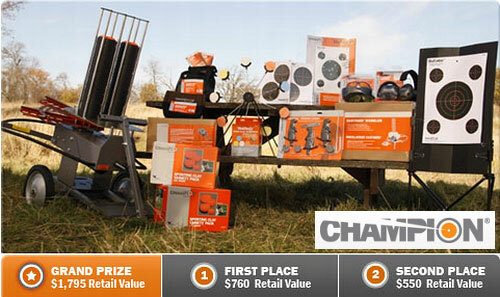 Shooters can enter the Champion Range Contest at www.ChampionBackyard.com. For a chance to win, submit a 200-word essay explaining why you deserve the grand prize shooting range system. CLICK HERE for Official Contest Rules. Three lucky shooters will each be awarded a personal shooting range system. The grand prize is a fully-loaded shooting range system worth more than $1,700. Two additional prize packages also include valuable Champion gear. All of the shooting range systems will include trap throwers, VisiColor targets, eye and ear protection, shooting accessories and more. Share the post "Win Gear in Champion’s Third-Annual Range Contest"